In part 7 our series of re-posts of the youth interviews from the WMF Youth Facebook page, we have an interview with Silvio Krauss who earned two silver medals in the YEC last year.. In case you missed the sixth in the series, you can catch it here. The following interview can also be found here. Club:	1. MGC Mainz e.V. Q1: How and when did you start to play Minigolf? 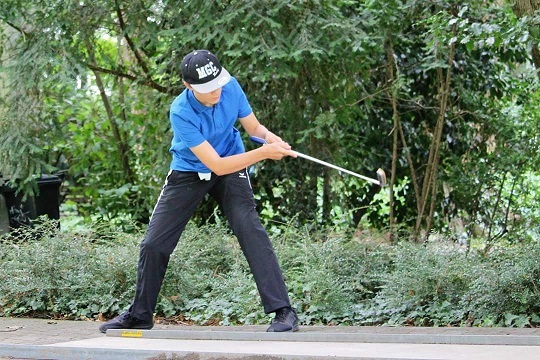 SK: I started to play minigolf with my family in our holidays during 2012. I begun my journey in Mainz and I am still playing for this club today. Q2: What is your favourite ball? SK: My favorite ball is 3D Club 18. I use it a lot. SK: I do not really have a favourite surface I like to play on more than the others. I play on all surfaces (concrete, miniature and felt) with the same enthusiasm and I welcome every different challenge/experience they give me to evolve as a player. I am proud of playing two straight 18 rounds after each other on miniature. It was a great achievement! SK: Yes, Manuel Szablikowski. Because of his style and techniques. He have been really helpful and therefore a great inspiration for me. SK: Friendship with players from other countries. Like Sweden, The Netherlands and so on. SK: My first Youth European Championships 2017 in Askim (SWE). SK: The variation of playing the ball, the deep concentration and the emotions you show when something great is happening.